We are so lucky to be living in Chicago, where live theater is alive and well and, perhaps best of all in this tough economy, affordable. Recently, my kids and I enjoyed an evening at an out-of-the-ordinary circus for much less than what it costs to attend a ho-hum Hollywood blockbuster at the movies. We sat together, picnic style, at the edge of the Aloft Loft performance space where El Circo Cheapo thrilled us with some amazing feats. 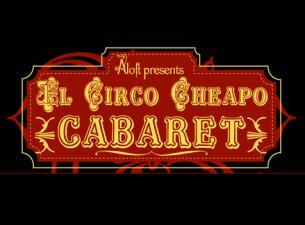 El Circo Cheapo is a cabaret style circus, featuring humans that can bend, contort, leap and (just about) fly. My son, age 10, marveled at the jugglers. My daughter, age 2, loved everything about this circus, but especially the tightrope walker and hula-hooper. I appreciated the hilarious wit of ringmaster Cameron Esposito. Picnic style seating meant that we sat comfortably, in the front row, on a blanket that we brought from home, with plenty of wiggle room. (Regular seats are also available). Catch El Circo Cheapo! onstage, the first Saturday of every month, at Aloft Loft, a former warehouse in the Kinzie Corridor, at 2041 W Carroll. Ticket prices range from $10 – 15, and kids under 5 are free. The 7 PM performance is very family-friendly but the 10 PM is 18+. This entry was posted in Arts/Culture/Entertainment, Family and tagged el circo cheapo, family fun in chicago. Bookmark the permalink. Awesome… I couldn’t agree anymore about the fact that we are living in Chicago city where live theaters are still alive. Today’s digital world it seems like live plays are becoming less. But it is fascinating that Chicago city still have on going live performance. Yup kids love El Circo Cheapo. It is full of fun where performer makes it more interesting by doing extraordinary tricks and jumps.